Arguably one of Australia’s best-known Aboriginal artists of the 20th Century is Albert Namatjira (1902-1959). Namatjira’s distinctive landscape paintings gained him international celebrity in the 1930s and 40s. Fame led to an offer of citizenship for himself and his wife at a time when Aboriginal people had few rights or legal recognition. 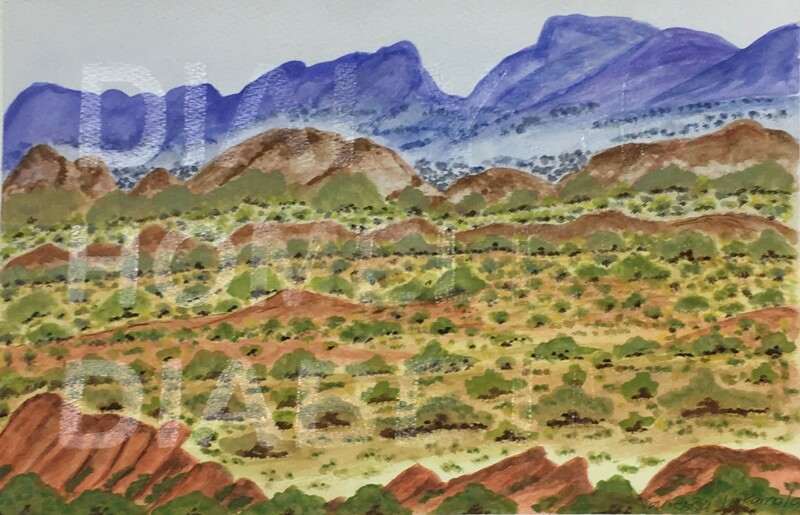 More than fifty years after his death, Namatjira’s artistic legacy continues as his children and grandchildren, and those of the other artists associated with the Hermannsburg mission continue to express their connection to their land through finely painted watercolour landscapes. Namatjira’s grandniece Vanessa Inkamala is one of this new generation, and took part in a recent project with artists Tony Albert and Timoteus Anggawan Kusno, this year’s recipients of the Kerjusama artists in residency program through Asialink and Artback NT. The paintings produced through this collaboration feature landscapes rendered in the Hermannsburg tradition, but with the addition of text painted in clear varnish. Each artist has chosen powerful words that address issues of health, housing, mining, and copyright – reflecting the extreme social and political issues affecting their community. In this most recent addition to the UTS Art Collection, the artist has written the words dialysis, homeless, and diabetes – all issues that have had direct impact on her life and those around her, and all potentially preventable or mitigated through appropriate action. Just as her great-uncle’s artworks contributed to the wider recognition of Aboriginal people, so these most recent works tell the story of his people’s journey since his time, and how much further we all have to go.